5 star hotel, but gets a 3 1/2 star review. 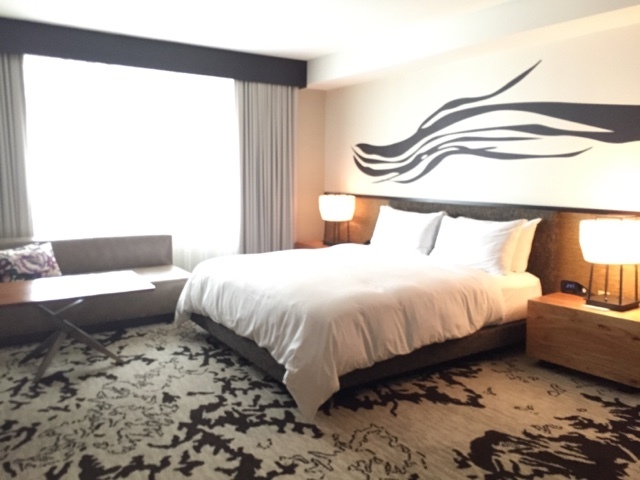 I originally booked a 2-night’s stay with Caesar’s Palace, and then was offered an upgrade to the exclusive Nobu for $45 more. Of course, I said yes! 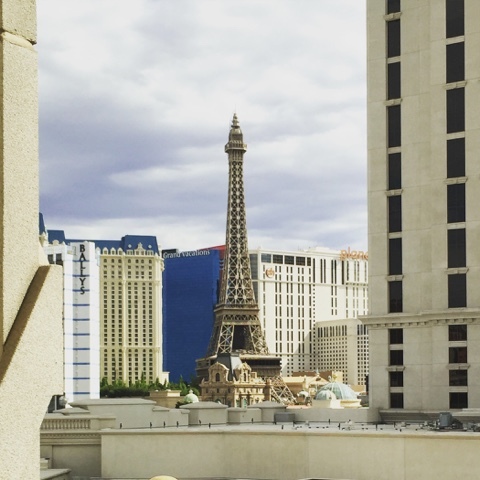 This boutique hotel is not really affiliated with Caesar’s Palace, but just occupied the space on the property. 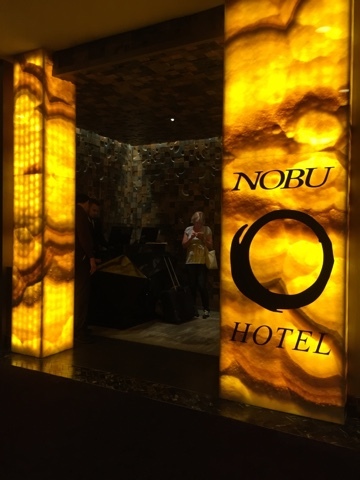 Nobu Hotel has their own entrance, their own staff, and their own check in service. It is state of the art chic. To gain access to the room, you need to bring your key to the reader, and then select the floor you want. 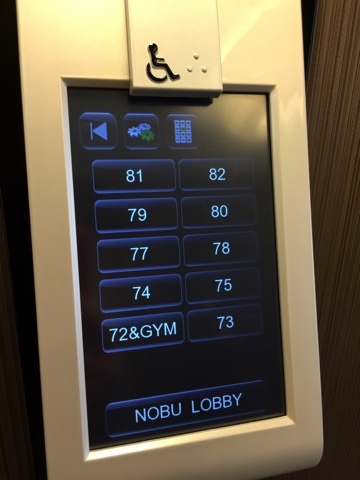 The screen will tell you which elevator door to wait at, which will automatically take you to the requested floor. 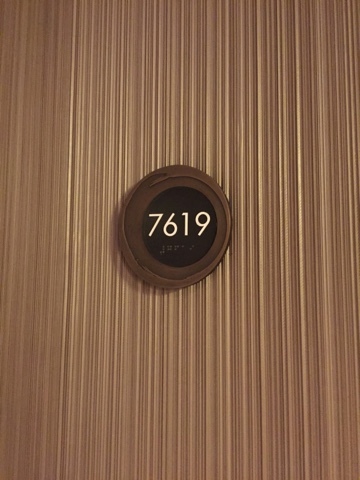 My room was 7619, but it wasn’t the 76th floor. 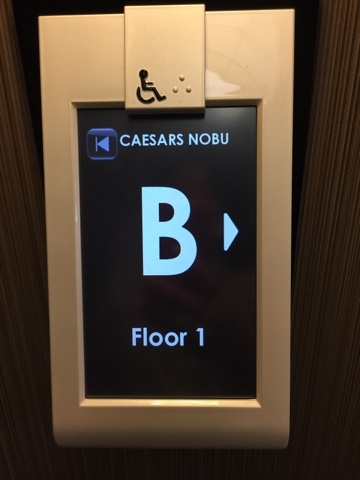 Nobu isn’t that tall, so this is actually the 6th floor of this tower. 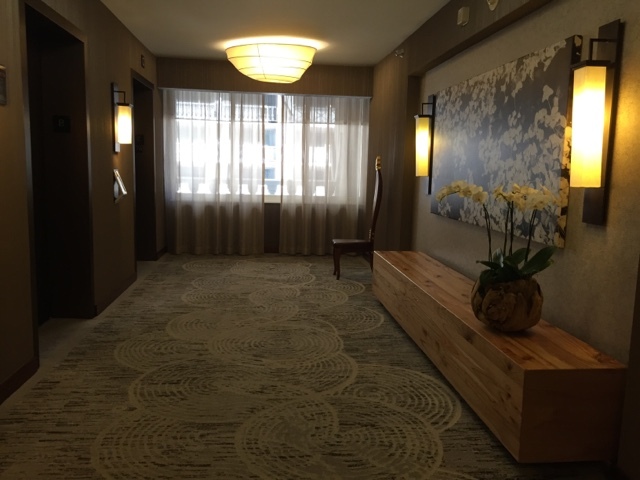 Upon walking in, we found the adjacent room’s door open, and thought our room continued on. I first spotted a billiard’s table, then clothing on the sofa. EEK!!! It was someone else’s room!! 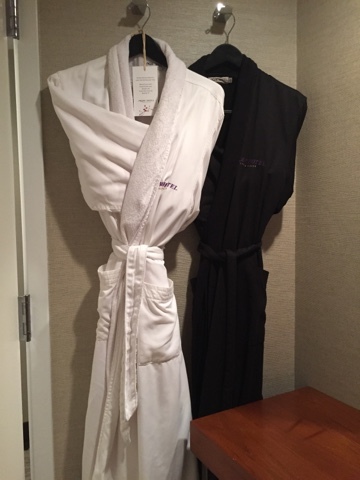 We quickly found housekeeping, who didn’t realize what we were panicking about. She then closed our adjoining door, and more or less said “oops”. Meanwhile, my standard size king bedroom was pretty large and spacious. It had a king size bed, a large big screen tv, plenty of storage with the armoire, and a sitting area. The decor was Asian inspired, which included a dragon motif mural, Asian artwork, and even Japanese slippers in the armoire. 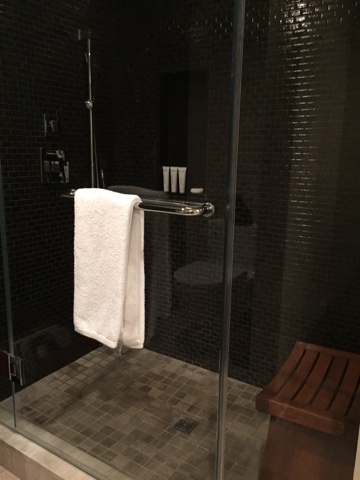 The bathroom was very spacious, and had a vanity area, his/ her bathrobes, a scale, a steam shower, and plenty of fluffy towels. 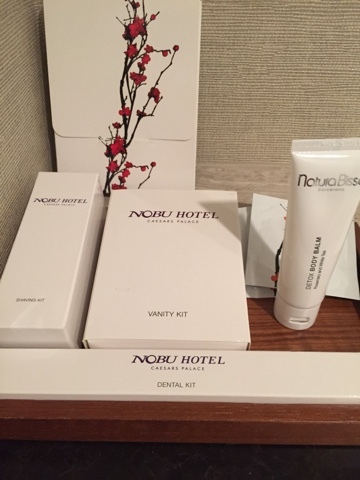 In addition to a magnificent toiletry selection which included not just the typical shampoo, conditioner, shower gel, and lotion, there was also a shaving kit, toothbrush/ toothpaste, make up remover, night cream, and a vanity kit which had cotton swabs, q-tips, emery board, cuticle stick, shower cap, and micro cloth. 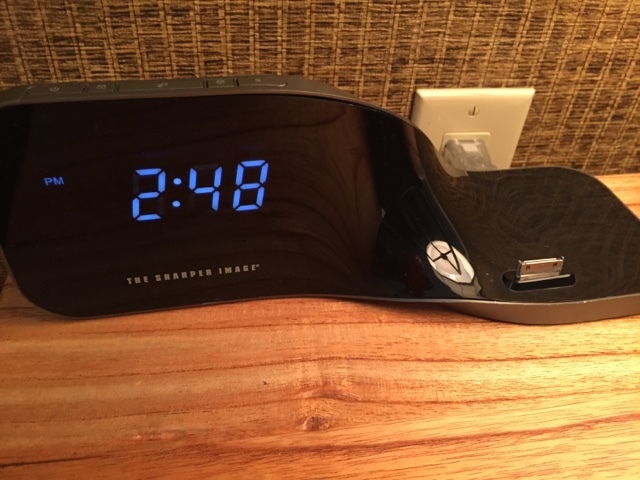 At night, housekeeping would come by around 9:00 pm to turn down our room. In addition to turning down our bed, she would lay out slippers by the bed, put a bottle of water on the nightstand, and a lavender mist spray. 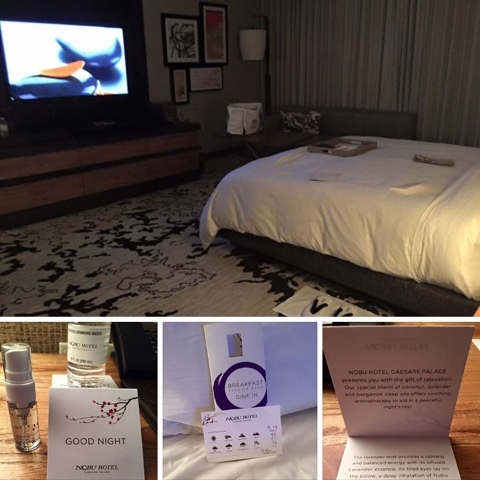 Also, she would turn on the Nobu turndown channel, which played soothing music and spa images on the screen, and placed the weather forecast on the pillow. 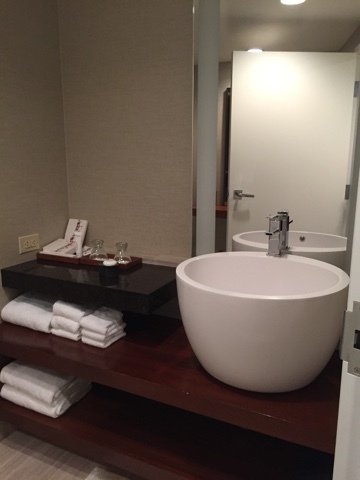 In addition, the bathroom was tidied, towels refreshed, and trashcans cleaned. After all this glowing praise on how great Nobu is, why would I say that I’m going to give this place 3 1/2 stars?? Poor Guest services response time. Apparently, all guests are to receive a “welcome tea”. 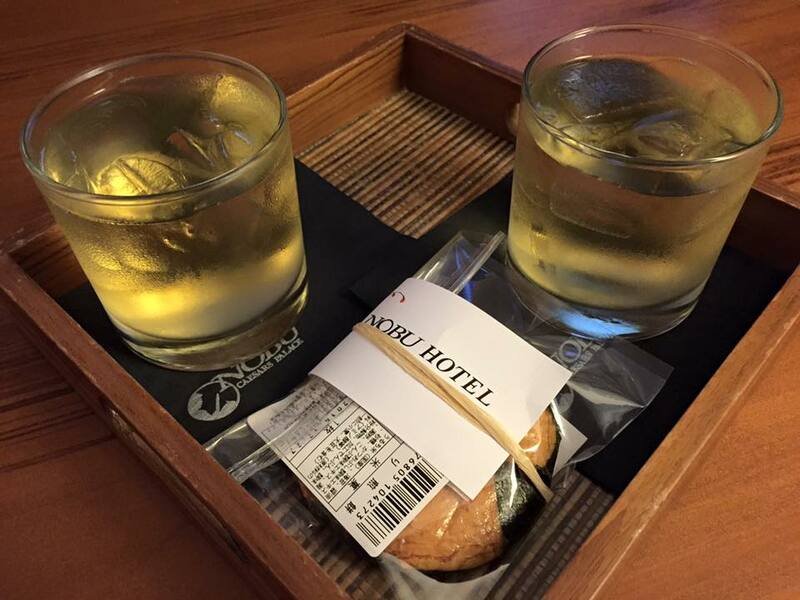 I read multiple reviews that they received 2 hot or cold green teas and a traditional Japanese seaweed cracker. At first I thought I was not entitled to it because I was an upgrade from Caesar’s Palace. The front desk assured me it was not the case, and at 6:00 pm said she would send someone up to give me my welcome tea. I also told her that my floor lamp was broken, and she said she’ll send someone to fix it. So, 2 hours went by and no tea or fixed lamp. The room was very dark with 2 lamps on the night stand, and I was surprised that there was not that much lighting in such a large room. Finally, I called again, and this time the front desk was able to send engineering up to fix my lamp. We still didn’t get the tea, so when we headed out for dinner at 9:00 pm, I told the front desk about the tea. We finally got our tea at 12:42 am. It wasn’t the tea I wanted, but the principle that every guest was supposed to be offered it.